I grew up in the sixties and seventies and have never experienced what it means NOT to be free. Oh yes when I started to work as a legal advisor in the 80’s, there was an economic crisis, there were – often older – men who acccused me of taking a place of a man because there was in that period a lot of unemployment and ‘there was no need for women to work at all’ as they angrily said. I didn’t build pension rights at my first job for that was not necessary for women. This is only 30 years ago! I must say my father and mother were always proud of my indepent nature and encouraged me to study and to go my own way. So as you know I don’t take my freedom for granted. Being a woman I am also grateful that I was born in Holland. Not only because I have the same rights as men but also because our society and fathers, mothers, brothers and husbands, support these rights. But what many people don’t know is that our mothers had for a long time almost no personal rights at all! So my song ‘Protect our Freedom’ is also written from the perspective of the protection of the freedom of women. 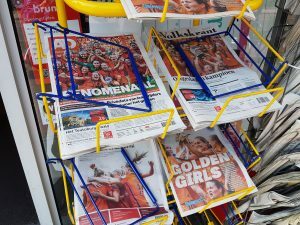 In this article I want to place some facts in order about women’s rights. And I am not talking about the wages which are still not the same, the same chances for jobs etc. Now I just give the dry facts. It’s hard to imagine know but our mothers were fired from their work the day they got married until 1956. Because of a ecclesiastical law ‘ so that she could be a dedicated mother and housewife’. Only in 1956 married women were allowed by law to work, open a bankaccount and to travel without the permission of their husband. In our law they were before 1956 aligned with childeren, weak-minded people and criminals. So women who married made until 1956 a big sacrifice. They lost their job, had nothing to say anymore about the kids and (also her) money. They had to ask their husband for money or permission when they wanted to buy anything a car, house, clothes, groceries etc. They could not get any insurance or money from the bank. The only freedom she had, was that she could walk outside and buy groceries for which she got pocketmoney. Quote in a famous newspaper ‘a man can hardly be expected to stay all day at home to pay the baker and milkman. He really has something better to do…’ to justify the pocketmoney. I find this almost funny now but it also makes my blood boil grrrr..
they also got the right to vote. To compare: the equal right to be chosen and to vote was introduced in England in 1928, Spain 1931, New Zealand 1919, Canada and India 1950, Syria 1953, Australia 1962, Switzerland 1971, Portugal 1976, Lichtenstein 1984, Kuwait 2005. And I want to emphasize that this does NOT mean that women had no rights at all. But the rights were not equal. Sometimes like in Holland they could already be chosen but not vote, or they were only allowed to vote to start from age 30 where men could already vote at age 21 etc etc. What is surprising, is that it took 37 years – from 1919 till 1956 – to further change a lot of laws in favour of equal rights and especially our marriage law. Maybe an explanation is that it was a society where people controlled each other in small communities and in which the church had a lot of influence. A Catholic was not allowed to marry a Protestant and vice versa, birthcontrol was a no go etc etc. I have to mention that the introduction of ‘the Pil’ or other anti-conception ofcourse also meant a major change for women and was very liberating! In 1975 a law was accepted for equal payment of women and men. In 1980 there came a law for equal treatment in general. This made especially on the point of Labor law a lot of difference. F.e. it was before 1980 a lot easier to terminate a contract of employment for women than for men. Even in 1980 there was a lot of protest against this law for equal treatment. 1981 the Women’s Treaty on the Elemenation of all forms of discrimination against women was adopted by the United Nations. Lucky me that I have been brought up in an open minded family in Holland and that I am a child of the sixties and seventies. For now I want to make my last point. To become a strong and independent individual – man or woman – means that the education has to start when you are young. Like my brothers I am used to walk freely on the street and deal with daily concerns. It’s like womens’ football: it’s getting better now because it’s taken serious and the scouting starts when they are young. Well I am proud that our ladies became yesterday first in the European Championchip! 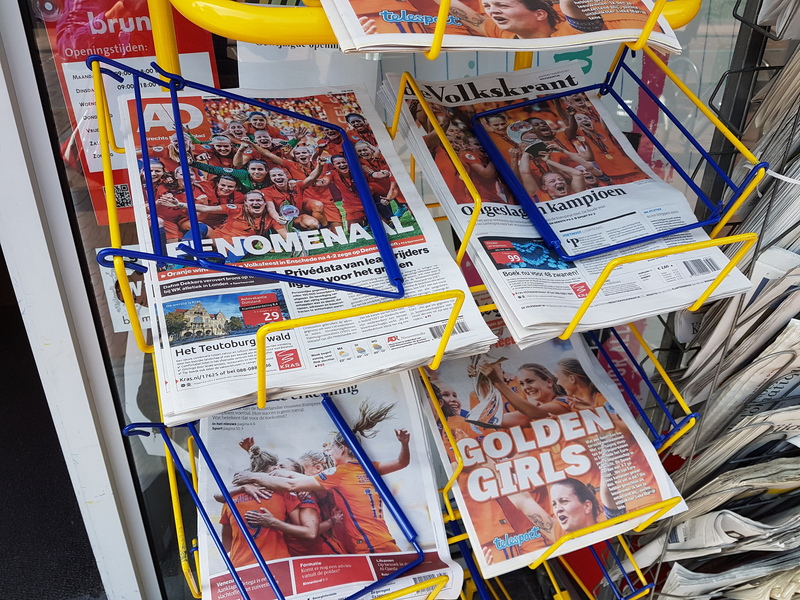 The Dutch magazines with pictures of the national women’s football team! Vorige Vorig bericht: The Do it OurSelves-society – who is fooling who?